Just bought a P-23 and really enjoying it (first sailboat). I'd like to re-route the lines to the cockpit. 1) has this been done? 2) how difficult is it? 4) pictures of how its worked on other boats? Best bet is to search on it. Leading lines aft has been documented, diagrammed, illustrated and opinionated several times. Good stuff here. Welcome @StevenG to the forum. As @Justin_NSA has shared, use the search tool and look for messages that say things like "cockpit lines" or "Re-route lines". It is likely going to be a project that you can get ideas but will have to design your self as there are not a lot of P23 owners here that have posted such projects. It is really one a rocket science project. You will need to bring the lines down to the bottom of the mast. Install some blocks to turn the line direction towards the cockpit. 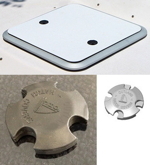 Often folks install a Halyard Organizer Plate at the base of their mast. Something like this. It allows them to attache a turning block to take the line from the mast and turn it towards the cockpit. You can then run the lines through a clutch to hold the line in place. You might want to search out local boats to see what they have done. This will at least get you started. Take you time with the project. The most difficult part in my opinion is deciding where to run the lines to reduce friction and not create a tripping hazard when you want to move about the boat..
Post some pictures.... specifically the mast area on both sides... then shots of the cabin roof on each side... we can help you with the routing options then. This picture shows a boat that uses the winches for both halyards and sheets... there are many, many ways of doing this project... I've changed the set up on my C27 at least 3 times.... moved stuff around, new equipment etc.. If you're on a budget you can install simple, less expensive cleats instead of clutches... A small standard winch (not self tailing) such as the Lewmar 7 .. is more than adequate as a halyard winch on a 23 footer and it won't break the bank. 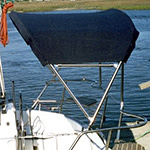 So, the halyards need to get from the mast base out to a "deck organizer" which turns the line aft to the winch and cleat near the cockpit. When you have a winch.... the cleat goes ahead of the winch, btw. HINT.... choice 3 is the least expensive. Then.......... you'll want a deck organizer to turn the lines around the hatch back to the cockpit area. A cleat... your money, your choice. And finally..... a winch.... may be optional... but again... your money, your choice. You can do your own search for self tailing winches.... prepare to spend $475 plus for an appropriate sized single speed model. If you use a stopper, the device to the right of the cam cleat in Joe's post, you don't need a self tailing winch. In fact when you have one winch servicing several lines the best practice is to keep the winch free of lines and available for use. Be careful to lay out the runs to make sure that they run fair and that lines don't chafe on any block cheeks. This can be multiple dimensional and sometimes shims are necessary under some of the hardware. The run from a stopper with multiple lines to a winch aft of the stopper can only run fair for one line. The others will be slightly out of alignment. Make them occasional use lines if possible or use a bollard to turn them. The closer the winch is to the stopper the more of a problem this can be. Test the stopper location so that you can reach it from a position in the cockpit that works. If you use a cam cleat it's location should be such that you can snap the line up from a comfortable position in the cockpit (Without having to stand on the seat). Convention puts the main halyard on the Starboard side and the jib to port. I hope these details help. A successful outcome requires good planning.